Most parents are surprised at the ease with which small children can fall from beds, changing tables, and high chairs. Even before they can roll over, they have a remarkable knack for propelling themselves off an elevated surface to land, thud, on the floor. Cats land on their feet. Babies land on their heads. This is not just to frighten their parents – it turns out that their center of gravity is in their heads (ours is in our bottoms). Those relatively large heads enable them to learn at a pace unequaled in the rest of their lives (except during medical internship, for those of us so inclined – a kind of second infancy, where we’re up all night, cry a lot, think we’re the center of the universe, and aren’t capable of doing much on our own). Those same large heads can get them in trouble when they fall. Part of my job as a pediatrician is to warn new parents, not used to baby behavior, of this risk of falling. Most of these falls can be prevented by attention – and staying between your baby and the floor. Still, most of us parents experience a baby falling at some point. Thankfully most of these early falls have happy endings. A fall from the height of a bed or a crib may crack a collar bone, or even a skull, but is extremely unlikely to result in a serious, debilitating, or life-threatening injury. 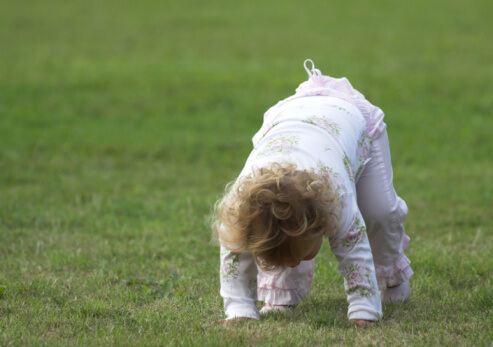 The danger increases when children begin crawling and walking. Often they have no sense of fear. The greatest dangers come from falling down stairs, falling out of windows, out of shopping carts, and off buildings or playground equipment. The severity of playground injuries correlates primarily with the height of climbing equipment – not with safety regulations or types of playground surfaces. Your child’s days of innocent exploration can be prolonged (and his or her life saved) by your installing protective gates at the top and bottom of stairways. Even more important is installing window guards or locks on all windows above the ground floor. The same advice goes for grandparents’ homes. Most fatal falls in children are from windows or other structures more than one story tall. The risk of this type of fall decreases as the child gets more coordinated and more cautious about heights (usually from a few painful, short falls). At the same time, though, the risk for another type of fall increases.